Got a burning passion for health? Ready to make a difference? We’ve got you covered. Together we will create health evidence and transform biomedical discovery. And we’d love you to be with us. 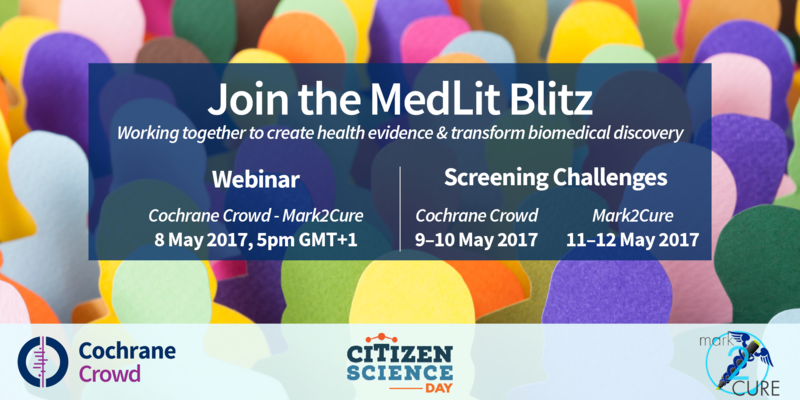 Cochrane Crowd has run a number of successful citation screening challenges and we’re upping the ante by running a bigger event, the MedLit Blitz, with our wonderful partner, Mark2Cure. And it just so happens to coincide with the anniversary of both platforms and with Citizen Science Day 2017. Get ready to celebrate! What exactly is happening for the MedLit Blitz? We’re running 2 x 24-hour online screening challenges. The Cochrane Crowd challenge begins on Tuesday 9th May at 10am GMT + 1 (UK time zone) and finishes at 10am on Wednesday 10th May. The Mark2Cure challenge begins on Thursday 11th May at 7pm GMT + 1 (UK time zone) and finishes at 7pm on Friday 12th May. Of course, we’d love you to do both challenges in their entirety! Just kidding. Any contribution is welcomed, whether it be a few five-minute grabs or a more focused effort. You can choose to contribute to one challenge or to both. Sounds good so far. But I’m new to Cochrane Crowd. What is it all about? Your best bet is to watch our 2-minute video introduction here. If I join in, what will I be doing? Your mission in Cochrane Crowd is to identify studies that provide the best possible evidence of the effectiveness of a health treatment. Once identified by the Crowd the studies go into a central register where health researchers and practitioners can access them. The more studies identified by the Crowd, the more high-quality evidence is available to help health practitioners treat their clients. Your mission in Mark2Cure is to identify how genes, diseases, and drugs are conceptually related, based on biomedical text. Mark2Cure works by teaching citizen scientists to precisely identify concepts and concept relationships in biomedical text. Once these tasks are completed, statistical algorithms take the data provided by the volunteers and use it to provide scientists with new tools for finding the information that they require. Don’t be spooked by the science speak! You don’t need any prior knowledge to contribute to Cochrane Crowd or Mark2Cure. We’re glad you asked! Prizes will go to the top three MedLit Blitz contributors. The winners will need to have taken part in both challenges. What are the prizes, you ask? You’ll have to wait and see! As for the details: your contribution will be scored according to the number of citations screened in Cochrane Crowd plus the number of relationship annotations submitted in Mark2Cure. I’d like to know more about Cochrane Crowd, Mark2Cure and the MedLit Blitz. Brilliant! We’re running a webinar on Monday 8th May to talk more about all of the above. Everyone is welcome, whether you’re already contributing to one or both platforms, or are a complete newcomer. How do I sign up for the MedLit Blitz? The process is very simple. You just have to sign up to the platform(s) you’ll be contributing to. Once you are signed up, we will email you with a reminder or two about the Blitz. Sounds fun, can I tell all my friends about it and get them to join in? Yes please! We want as many as possible to join us. You could share this page, retweet our tweets, or include information about the MedLit Blitz in your organisation’s newsletter or website. You can email Emily and Anna from Cochrane Crowd at crowd@cochrane.org and Ginger from Mark2Cure at gtsueng@scripps.edu. And don’t forget to follow us on Twitter! Anna Noel-Storr is the Information Specialist for the Cochrane Dementia and Cognitive Improvement Group. She also works on a number of projects including Cochrane Crowd. In 2013 she won the Thomas Chalmers award for best oral presentation presenting the results of two studies assessing crowdsourcing within Cochrane.